Monday Morning! | Tweak your week! Wouldn’t it be wonderful if we could embrace Mondays the way we do Fridays? We are excited for the weekend. Let’s also get excited about the coming week and the blessings it will bring. The cloud cover and cold air has me wanting to hunker back into my comfy bed. This is not an option today with the to get done list I created last night. I didn’t hear the robins chirping this morning. Only the dismal sound of the crows which filled the sound space all winter. 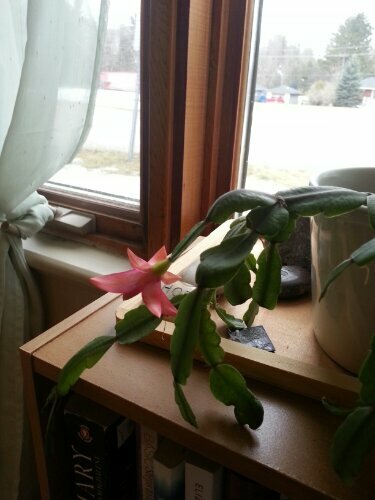 Even the Christmas cactus, although beautiful, is confused by the lack of spring. If you are able look really closely behind the blossom. I have a stone there that is inscibed with the word HOPE. That’s really what I needed to see; what I need to be reminded of. There is hope. Hope in spring-like weather, in the fullness of today even without the sunshine, and in the many things I give thanks for that I have not seen or experienced. Hope and faith are connected. And, both are connected with LOVE. Perhaps Mondays are pretty good after all. What will you do today to ensure you have a great day? Yes the sun IS out there somewhere and we draw breath and have COFFEE, yes life is good.